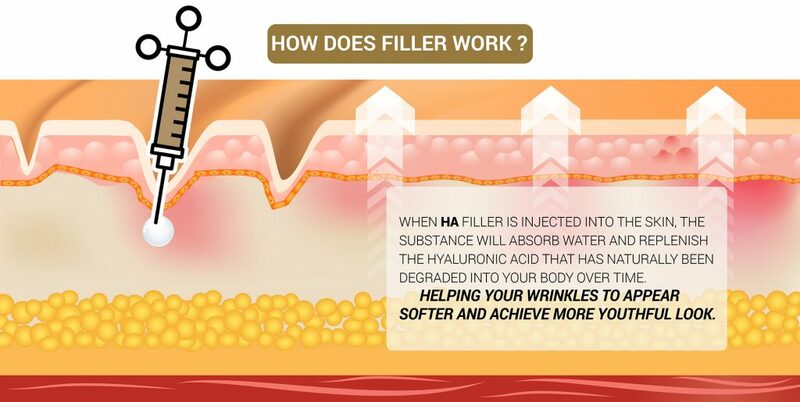 Filler is a Hyaluronic Acid (HA) substance which has high chemical stability and liquid absorbent property. This substance is naturally present in human body, and will eventually be physiologically absorbed and degraded without leaving any chemical residue. Thus, it is safe to inject this chemical substance into your body since the chance that it would cause any harm or allergic reaction is very low. However, the injection must be done only by experienced and professional board-certified doctors to avoid any risk of injecting into the blood vessels. 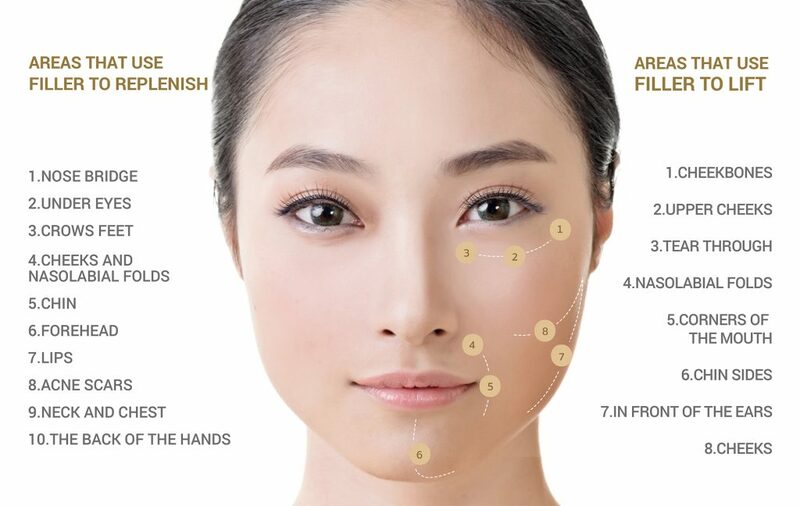 HA filler injection performed by qualified dermatologists with qualified products approved from the Food and Drug Administration (FDA), a government agency responsible for food and drug safety, will give you a naturally replenishing and rejuvenating effect on the skin. Besides, HA filler is an innocuous substance which will leave no chemical residue after it completely dissolved. 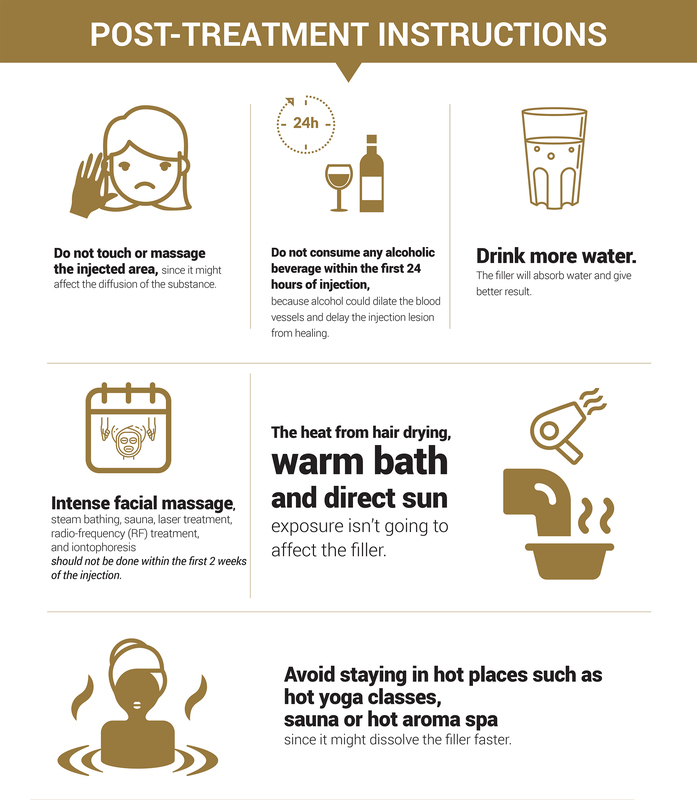 It will make you look younger, wrinkles appear smoother, with no severe allergic reaction and no downtime. Aside from its replenishing effect, HA filler can also be used for facial lifting and firming. Human faces consist of several pieces of fat called “Fat Compartment”. When we were young these compartments are contiguous and make the facial skin look elevated and firm, which also known as “Baby-fat Skin”. When we get older these fat compartments will gradually shrink and loose volume. This will create gaps between each compartment lead to flaccid skin on 8 common points between those compartments. The filler is usually injected just beneath the skin surface to smoothen and fill in those wrinkles. Instead, in 8-point lifting technique, the filler will be injected deeper into the fat layer to bind all fat compartments by filling the gaps between them. When each compartment gets closer, the skin will gradually lift up and look more youthful. 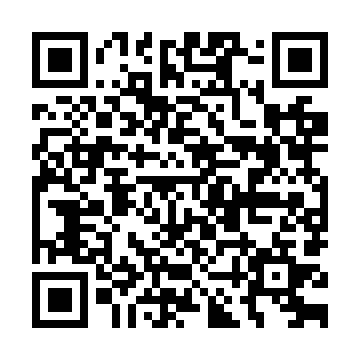 Who Is Suitable for HA Filler Injection? Avoid supplement intake such as vitamin E, fish oil, collagen, ginkgo extract, anticoagulants (anti-clotting) drugs, and some kind of pain relievers such as Aspirin and the other non-steroidal anti-inflammatory (NSAID) drugs, one week before the injection. As these drugs and supplements prevent the blood from clotting, they could result in bruising and bleeding spot underneath the skin. Furthermore, any congenital diseases, medical allergies records and/or pregnancy and lactation status are needed to inform the doctor before the injection.